May is the month where I seem to be spending a lot of time on trains to London (not counting the meeting at CILIP I had to send apologies for last week). Today was the first of these when myself and Selina travelled down to attend the University Science and Technology Librarians Group spring meeting. Not that I’m pretending I’m still a subject librarian, rather I was invited there to give a short talk about getting the most out of blogging and microblogging. After the day was introduced by long time friend and colleague Moria Bent (Newcastle) the first session of the day kicked off. What follow are my notes on the four talks. Hopefully there will be some more notes in a future post from Selina, so you can get her views of the day’s highlights as well. Embedding resources into the curriculum via a VLE (for scientists). Becoming embedded has become somewhat of a mantra at NTU – noted could run as many training sessions as you like, but this doesn’t mean they engage. Hence taking their resources to where the students are spending more time on the VLE. Their educational resources repository (Nottingham Trent Online Workspace, now.ntu.ac.uk). There is a block of library resources and training materials on this system. Referenced from all their course pages that relate to science. Need rights to edit, otherwise academic might not do what you expect them too. Need to sell what you do and be realistic. Work with your academic stakeholders and deliver according to your planned schedule, or else they won’t be impressed. Need to consider longer term – how will you maintain and update resources once live? NTU’s tech allows them to make global changes. Always consider next iterations – need to revise and update, preferably as part of an ongoing cycle. Keep items up to date. Doing this has helped make the library (and Jon) more visible to the academics. An open source web resource that can be downloaded and customised by anyone. It draws information from various different sources. MyLibrary is built on the back of analysing overlong customer journeys to resources, students should be able to access all the resources from a single point of access without having to go through multiple intermediary stages. Also interfaces with the library catalogue so can access your record, renew books etc. Provides a news feed as well, although that is under review. Calender for opening hours and events etc, driven by Google calendar, is also included. In many regards MyLibrary pretty much provides a single point of access to all of a student’s needs. While for the academic there may be a requirement for a more sophisticated resource, this was fairly impressive and doubtless would be well received by the student body. Talked about RSC Publishing Beta website for their hosted journals, ebooks and databases. Customisable for each user. Chem Spider. Training sessions to library staff to bring them up to speed on the basics of Web 2.0 so they can use it or not based on their own experiences! Made them think about what the academics needs were with respect to these resources, and if there was a need to train them. Facilitated training in a supporting environment, so people didn’t feel foolish and where they could see the clear benefits of producing them. Surveyed their college staff via email – free-text response. Fewer responses, but more dialogue from those who did respond. Aimed to run sessions for 25 people, at least that was how many they anticipated. 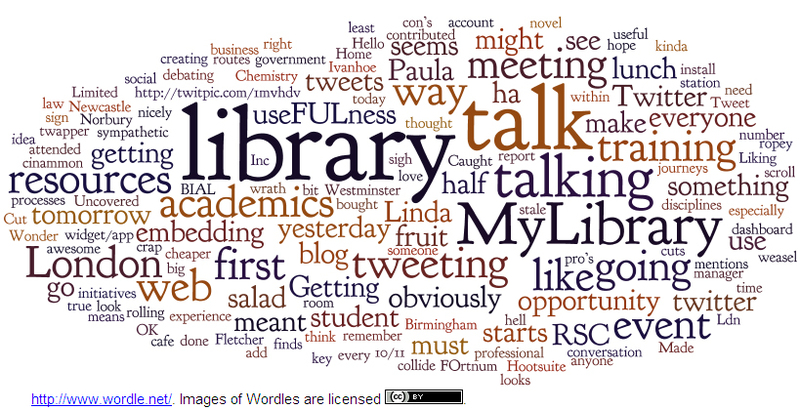 Do Librarians Dream of Electric Tweets? And that was my day in London. Next up, the RSP Advocacy Workshop! This entry was posted on 12 May, 2010 at 10:23 am	and is filed under Service Delivery, Web 2.0 & Emerging Technologies, Wider profession. Tagged: group, librarian, science, technology, university, ustlg, vle. You can follow any responses to this entry through the RSS 2.0 feed. You can leave a response, or trackback from your own site. The signal/noise ration on twitter can get a bit much at times, which is why having clients such as Twirl (my personal preference) and TweetDeck can really help out by working a bit like an email alerts service or sorting followed people into groupings. I’ve also found community members are very good at tagging things of interest with my user name so it shows up in my reply fields. That works well. But yes, I do acknowledge – can be daunting! I agree… Twhirl is my fave as it seems unimposing. It happily sits away in the background but alerts me to new tweets through pop-ups in the bottom corner of my screen. I can either click to read or ignore til I’ve a spare minute. I’ve also waffled on a great deal about the meeting. You can read it here: http://www.lexrigby.com/2010/05/11/the-dawn-of-a-new-day-and-the-ustlg/. Sorry for the shameless plug. Plug away Lex 🙂 I’ll go and have read in a bit myself.